Steve, Rachel, and I have been talking and thinking a lot about the Russian Bible School and what it meant to us. I hope I can put into words what we are feeling. It was an extraordinary experience for us. We went to the other side of the world where we knew no one (except Duncan), and we did not speak or understand the language. But we found that you can't remain strangers for long in the Christadelphian community, even if communication is somewhat hindered. Our common faith is a bond that transcends words. I think it was on the second day of the Bible School that I started writing down my observations during the Bible readings and discussion, which was in Russian with no translation to English. I noticed that there was never a period of silence when it was time for discussion. Many had comments to make or questions to ask, and there was much interchange of ideas and often animated discussion, no matter what the reading was about. We had the impression that the discussion would have gone on indefinitely had there not been time constraints. And we noticed that the women participated almost as much as the men. As we got to know more and more people at the Bible School, we came to understand why they have such enthusiasm for Bible study and discussion. For many of them, the Bible School is the only opportunity they have for fellowship with brethren and for exchange of ideas. For those who live in isolation, the Bible School is a vital support. For some, the Bible School is an opportunity to discuss the Bible without fear of persecution. The fact that our brethren there and in other parts of the world have been and are being persecuted for their beliefs had the most profound effect on us. We have felt inspired by their demonstration of faith in the face of hardship, suffering, and injustice. It has been our privilege to meet them and hear their stories. I think of the danger they live in because of persecution, and in my mind compare our lives of ease and comfort. Yet we live in danger as well. Our physical life may not be in danger, but our spiritual life may well be endangered by the physical ease and comfort that is ours in this life. Our brothers and sisters whose faith is strong when life is threatened will gain eternal life. The greater danger is the loss of eternal life as a result of apathy from comfort and ease. There were several things that were unique about the Russian Bible School. Witnessing the baptism of 18 people at one time is an experience we don't have in this country! The rejoicing and celebrating that accompanied the baptisms was uplifting. And it was very pleasant having Bible classes in the shade of a grove of tall trees, in long rows on either side of us and arching overhead forming a natural cathedral. Also unique was the socializing for the young people and the young at heart every evening in "Room 14" where songs were sung and games were played and new friends and fond memories were made! There were about 20 English-speaking visitors at the Bible School, from Australia, New Zealand, England, and the USA. We decided to sing some of our English hymns and found we had an instant choir with four-part harmony! The brothers and sisters from the Ukraine sang hymns together while waiting for classes to start, inspiring us to try our hymns a cappella as well. Most of the classes were given by English speaking brothers and translated into Russian. If anyone on our side of the world is interested in going to the Bible school, feel free to contact us for more helpful information. We highly recommend a visit to the Russian Bible School. It is not hard to communicate with the Russians; you quickly learn who speaks English, and they can help translate for those who don't. You just need to be brave and start talking! It is an enriching experience when we get to know our brethren around the world. 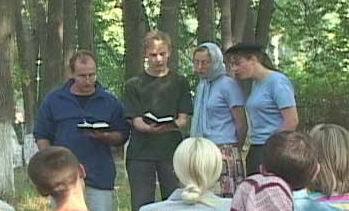 We feel our visit to the Russian Bible School this summer has been a blessing from God to us. 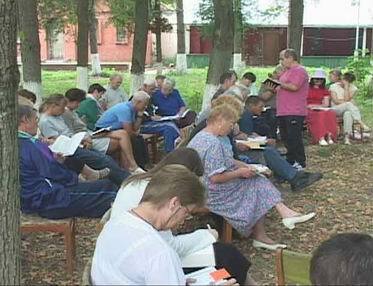 Our goal is to introduce our Russian brethren to the rest of the world by means of the videotape of the Bible School. We all have much that we can give to each other in terms of support and strength as we wait for our Lord's return to right all the wrongs in this evil world and bring our salvation.